Data journalism is attracting a younger cohort of reporters, who have undergraduate degrees but little training in data-oriented fields like statistics and coding, a new report has found. The Global Data Journalism survey, which was the first of its kind, studied the current state of data journalism in newsrooms across the globe, quizzing 181 respondents from 43 countries with the aim of providing theoretical and practical guidelines for the future of data-driven journalism. In its initial results, released in Dublin yesterday (6 July) at the European Data and Computational Journalism Conference, the survey found that 78 per cent of respondents had under 10 years of experience in the industry, with only 11 per cent having worked for over 20 years as journalists. The survey, conducted by Bahareh Heravi from the School of Information and Communication Studies at University College Dublin, and Mirko Lorenz, an information architect and co-founder of Datawrapper, was open to all data journalists and reporters globally. It was launched on 3 December and closed on 10 May, comprising of 48 questions ranging from the size of the participants' organisations, to the platform they produced their stories for. Some 77 per cent of all participants produce content for online publications, followed by print newspapers at 8 per cent, and radio at 4 per cent. Most of the participants (32 per cent) worked in publications with 500 or more employees. When asked about the status of data journalism in their organisations, 46 per cent said they have a dedicated data team, and of these, 70 per cent operate with small teams consisting of fewer than five members. Only 5 per cent of survey participants had large data teams of more than 15 people. 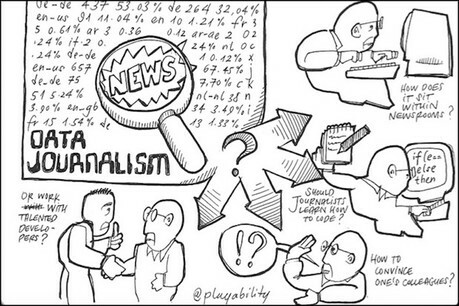 Although the majority of those who took part in the survey (86 per cent) considered themselves data journalists, only 18 per cent rate themselves as experts in data journalism. Some 44 per cent of respondents identify as having a better than average knowledge in the discipline, and 26 per cent identify as having average knowledge in the field. In fact, only half of participants had formal training in data journalism even though 62 per cent received an undergraduate-level of formal training in journalism itself, with 96 per cent having a university degree of some kind. Training in data-oriented and technical aspects such as data analysis, statistics, coding, data science or machine learning was low and of varying degrees. As formal training between the participants seems to have been mainly obtained through higher education and university degrees, the survey's conclusions highlight the importance of including data-related courses and modules in relevant higher education journalism and communication programmes. Some 65 per cent of the survey respondents agreed or strongly agreed that data journalism allows them or their organisation to produce more stories, while 13 per cent somewhat disagreed or strongly disagreed with this statement. Meanwhile, 90 per cent of respondents agreed somewhat that data-driven journalism adds rigour to reporting. Read the initial findings of the survey here (page 5) – more detailed analysis is due to take place.